Toyota recently turned to be a topic of discussion; no there isn’t something miraculous but an unpredictable concept. 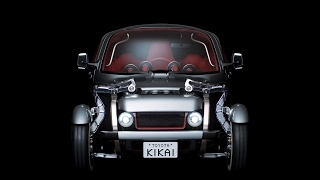 We are talking about the recently un-curtained Toyota KiKai Concept 2015. The model has a remarkable interior but an unpredictable exterior featuring everything open. We are talking about the engine and other parts which till date used to be beneath the thin sheet of metal. 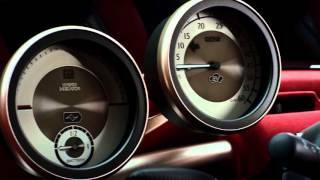 Let us have a closer look at the details through the review of Toyota KiKai Concept 2015. The interior of Toyota KiKai Concept 2015 is simple and to a lot extent carries the mechanical theme of its exterior. Cabin includes a driver’s seat while behind it is a bench seat for two passengers. Dashboard is a bar mounted with analogue gauges which will remind you of the past days when automotive industry was finding its way to modernism. The set of gauges include a clock, fuel gauge and a massive round gauge with a big arrow in it. I have no clue about what it is made to point at. The windows inside the concept get a bigger stance while the moving parts which used to be behind the curtains make things beautiful with their visibility. In fact you can see wheels and suspension through two windows located beneath the driver. In all rounding up the interior details of Toyota KiKai Concept 2015 I would say, though simple yet the interior looks attractive. The exterior of Toyota KiKai Concept 2015 might not look as attractive to you as we found the interior. The primary reason behind it is the visibility that is being provided. Entire frame is exposed, making the engine, exhaust headers and other mechanical parts visible. Up front the wheel arches are kind of missing and we have motorcycle-like fenders over the wheels however the exterior color makes things look pretty good by mixing itself with the exposed machinery. Doors are traditional and so are the rest of the parts. 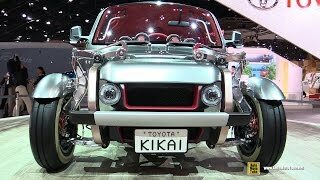 In all talking about the exterior details of Toyota KiKai Concept 2015 I would just say, it is something which might take time to have people’s acceptance, if by any means this turns to a production model. 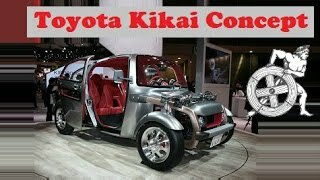 The performance figures of Toyota KiKai Concept 2015 are not yet shared but as the engine can be seen, one thing is for sure that it’ll be a four-cylinder engine. The power output figures are speculated to be low but I presume the model will be light in weight and could walk well even with low output. 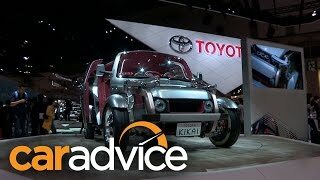 Let us see if the company comes up with the production model of the Toyota KiKai Concept 2015 in near future and the people’s acceptance to this unique creation.